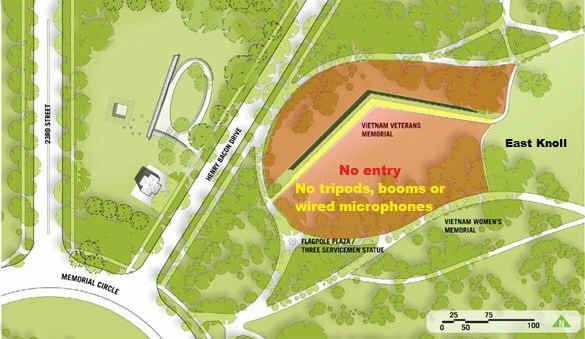 This is the area where members of the press can find detailed information about VVMF and its many programs and activities. The Vietnam Veterans Memorial is maintained by the National Park Service, which has rules about press activities at The Wall and on the entire Memorial site. The Vietnam Veterans Memorial is a sacred place where families and friends go to remember and pay tribute to loved ones. These guidelines were developed to preserve the sanctity of the Memorial. 1. No one may stand on the grassy area on top of The Wall. This includes photographers and videographers. 2. Tripods may not be used on the walkway in front of the Memorial or leading up to it. All cameras used in this area must be handheld. 3. Sound may not be used at the Memorial. If you are conducting an interview, please do it away from The Wall in the grassy knoll east of the Memorial. B-roll only may be shot at The Wall. 4. Please do not inhibit or disrupt the experience for visitors at The Wall.